stew | Crappy Kitchen - Good Dinners! This goes to the top of my list of “favorite things to do with pork!” I was completely surprised at how throwing a stew together out of desperation to use up a hefty pork shoulder resulted in this heavenly pot of smoky, juicy, tenderness. If you love nothing better than a stew to warm you and the whole family up when the chill in the air is biting, then this is your next dinner idea. A couple of other reasons I ended up with this combination of ingredients is that over the holidays I bought a couple of extra special vegetables that got overlooked in the cooking madness that was my life for a solid week, and only surfaced when the din of my kitchen returned to its quiet hum. If you love the flavor of celery as I do, you will love the ugly vegetable pictured below! It is the root of a variety of celery, and has a robust and deeply satisfying earthy quality that is addictive. It can be used as I used it, in a stew or soup, or can be mashed like a potato or made into a velvety puree. So, don’t let its knobbly, and wiry brown-haired appearance put you off: peel it and carry on! I also had an abundance of fresh zesty cilantro to use up and a can of opened chipotle peppers in adobo sauce (see note below) in the fridge that needed to be used or would go to waste. This combination of flavors would turn this pork into something bordering on what I think of as Mexican flavors, and that was fine by me. 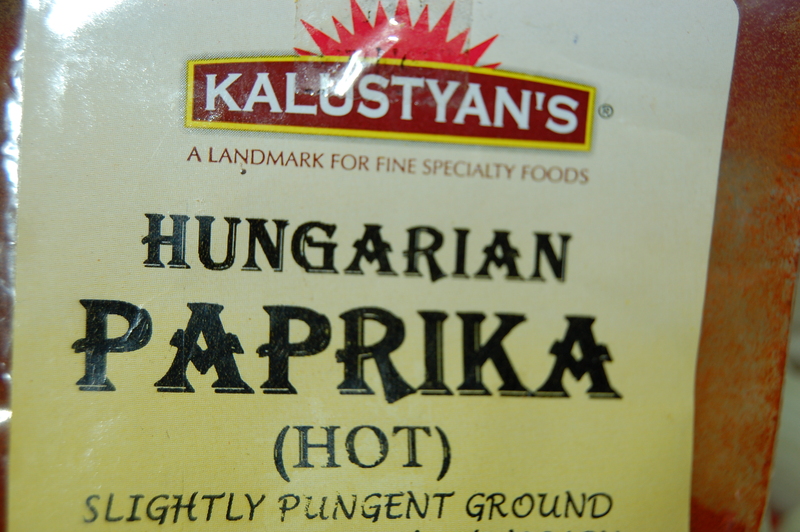 This can be cooked the day before and simply reheated on low on your stove top. This makes it a great dinner party dish and leaves you very free to have fun with your guests. 1 – Prep all ingredients as instructed above, including the meat. 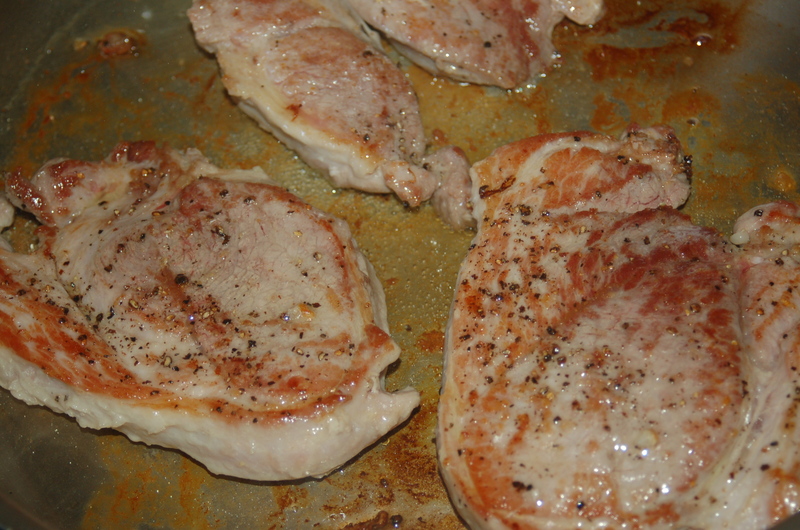 2 – Dry pork chunks and season with the salt and several grinds of black pepper. Put big saute pan or heavy casserole on high heat and add 2 tbs oil. When it is smoky hot, add some of the meat, making sure NOT to crowd your pan. Do not touch for 2 minutes. Turn and brown the other side. Remove to a plate and set aside. 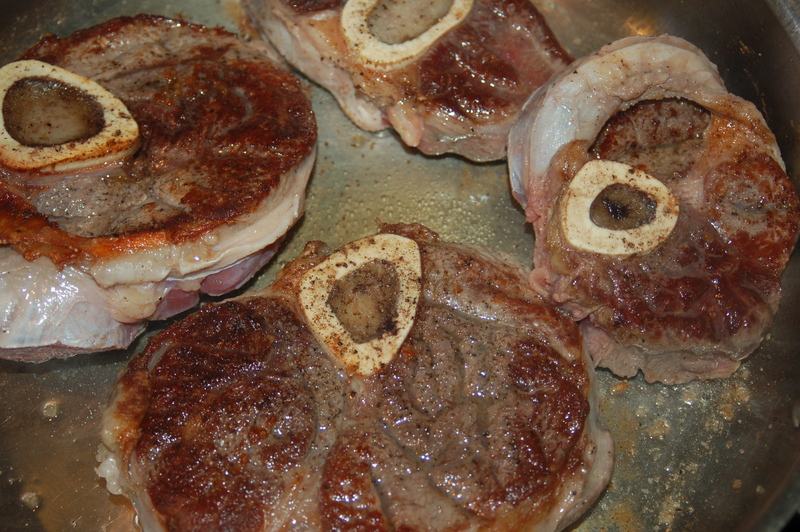 Continue until all of the meat has been browned, adding more oil as needed. 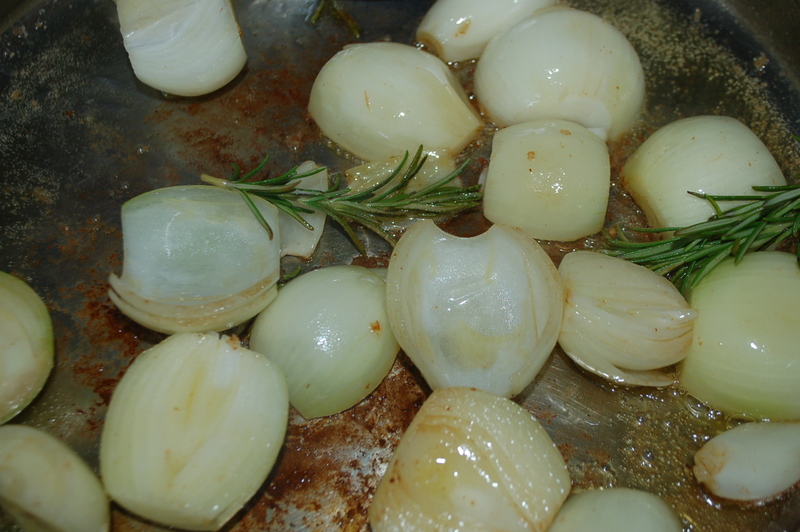 3 – Turn heat down to low/medium and add the onions and garlic. Cook for about 4 or so minutes, stirring occasionally. 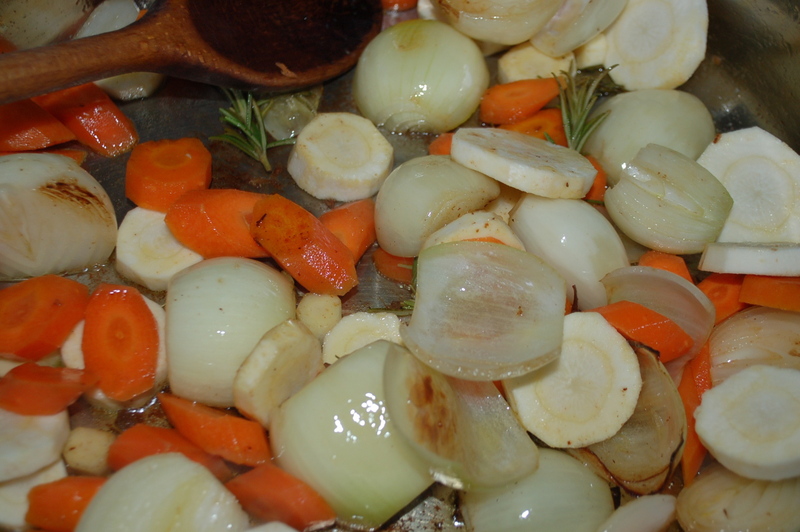 4 – Add the mushrooms and cook for another couple of minutes, then add the parsnips, carrots and celeriac. Give everything a good stir. 5 – Cook until veggie start to brown and then add the cilantro and chipotle peppers with adobo sauce. 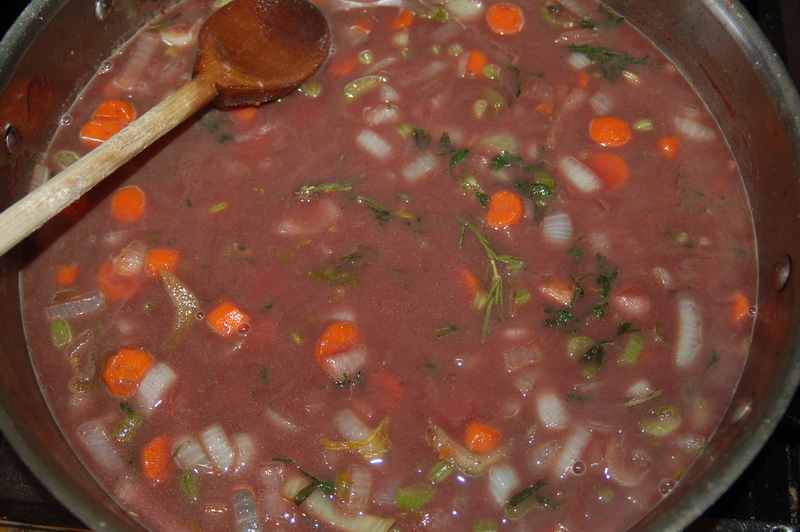 6 – Turn heat up and add the red wine. Bring to a boil and cook on high for about 2 minutes. 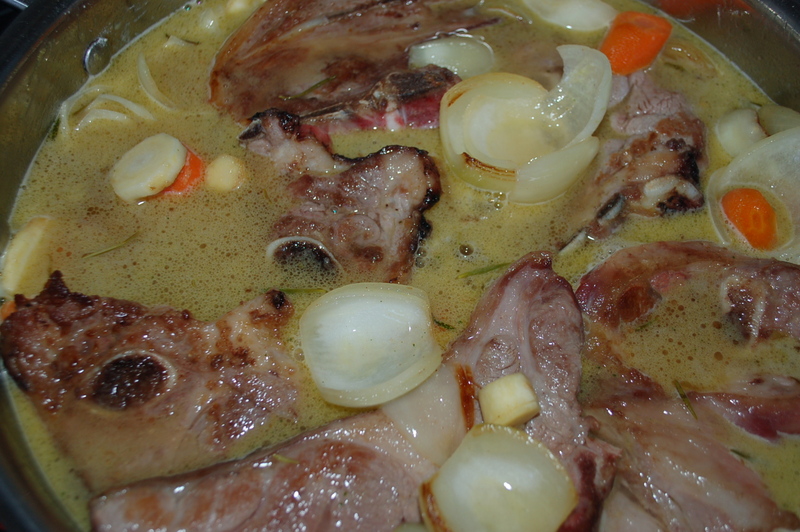 7 – Add the stock (or bouillon and water) and bring to a boil. Add the pork and bring back to a boil. Turn off heat. Cover with lid and place in oven for 1 hour 15 minutes. 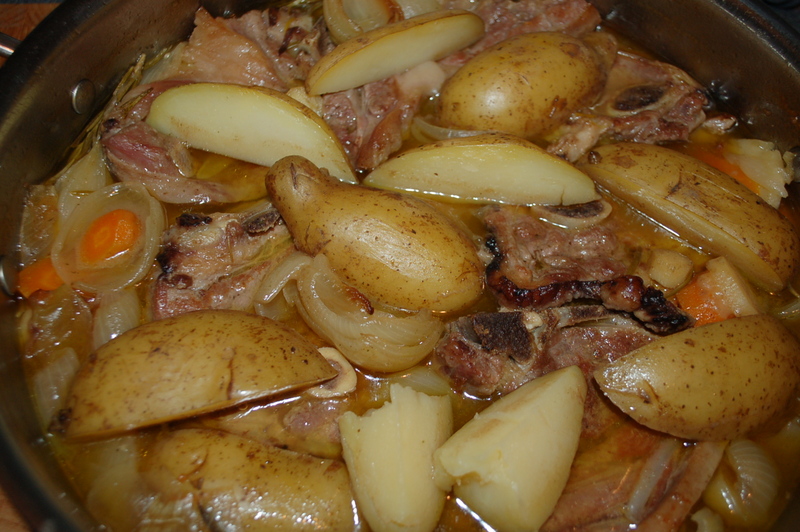 When you remove the stew form the oven, let it rest for 10 minutes before serving. I served it with rice and sautéed spinach leaves. You don’t have to be a vegetarian, a vegan, a gluten-excluder, a blood type A diet disciple, or a meat-eater to enjoy a lovely brothy bowl of this comforting stew. It is universally delicious and meets the requirements of what I think a stew should be: warming, hearty, with a feeling of regret when one comes to the last spoonful. Yes, the fact that it could possibly be one of the healthiest things you could put into your body doesn’t hurt either, although I refuse to eat something just because it is good for me. If it doesn’t taste good, I won’t eat it, even if it is medicinal. The medicine for my soul cannot be discounted! So, with my soul in mind, and a healthy regard for my body, I came up with this lovely soup. I am on a mission to make everyone like tofu, and it is quite the task. 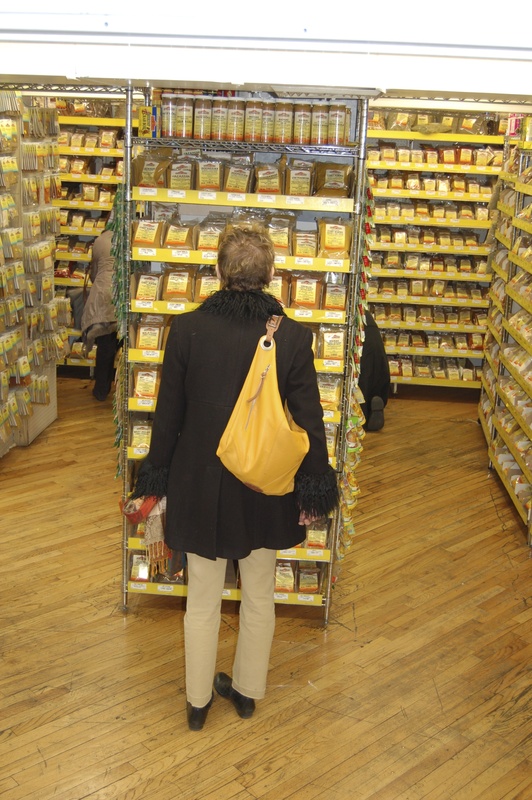 I am the first to admit that it has absolutely no taste whatsoever, but when surrounded by flavorful ingredients it has a tendency to take on their most prominent characteristics. The general tone of this stew was of delicate sweetness and the tofu cooperated beautifully. Place tofu on a dinner plate and stack 4 or so plates on top (or heavy pot as in my case). Pour off excess water occasionally (this can be done for an hour but you can leave it longer). When moisture has been removed, cube the block of tofu. 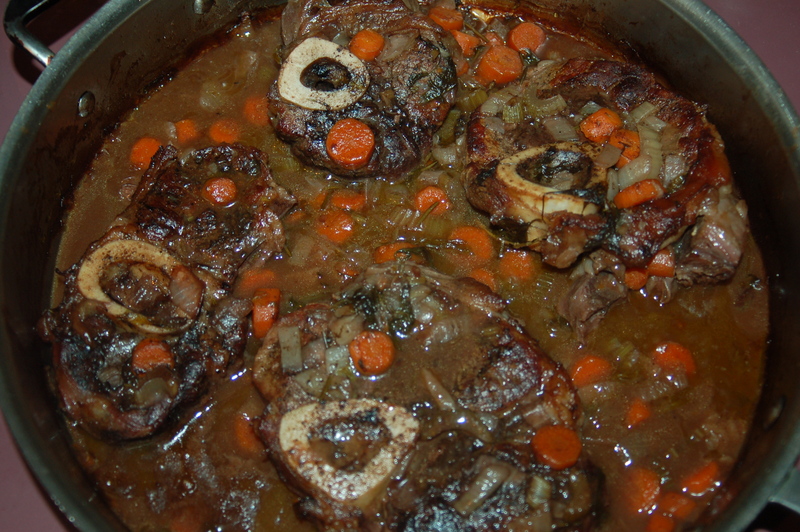 2 – Put medium soup pot on medium heat and add oil. Add the onions and garlic and cook for 10 minutes, stirring occasionally. Turn heat down to low and continue to cook for another 10 to 15 minutes, until very soft and have sweetened. 3 – Add the salt, pepper, chili flakes, curry powder and stock cube to onions and stir until cube has dissolved. 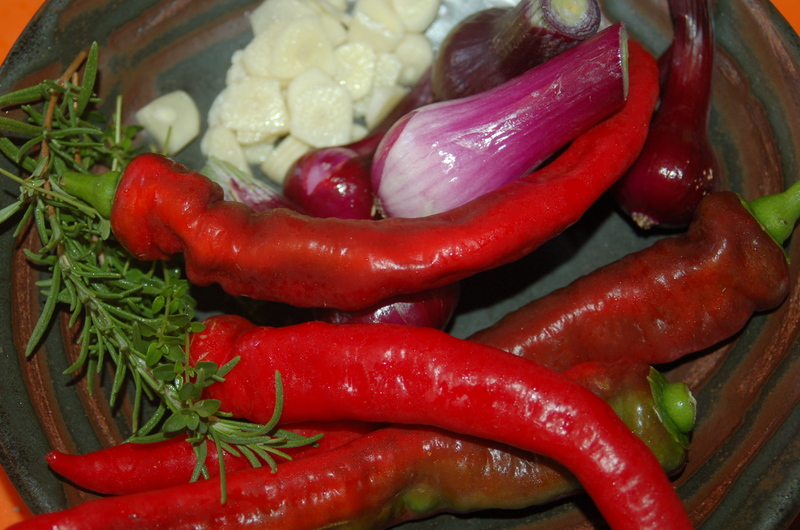 4 – Add water and turn heat up to medium/high and bring liquid to a simmer. 5 – Add tofu and bring back to a simmer. Place lid on pot and simmer for 5 minutes. 6 – Add peas and bring back to a simmer. Taste broth for addition of more seasonings (salt and /or pepper) and also add more water if you think it is too thick for your taste. Cover and continue to simmer for another 10 minutes. Turn off heat. Serve in warmed bowls with bread, adding more pepper flakes or black pepper if you so desire. For the first time in a long time I actually prepped dinner earlier, and was under absolutely zero pressure when I arrived home to deal with dinner at about 7pm! I knew I would be away all day, and had the nightmarish thought of kids and husband gnawing on whatever they could lay their hands on while I cooked dinner in a complete panic. I changed that scenario by buying a big piece of pork that needed plenty of time in a slow oven to coax out all it had to offer. fresh local veggies for my pork stew. I got started on this dinner in the early AM and turned the oven off as I left my house. This dish is embarrassingly easy to make, and, the reason for its success was due to the fantastic local produce, and the slow-roasting in the oven. Even though I made this on a weekday, I suggest it as a wonderful weekend dinner, when you have tons to do, but still want something lovely to eat at a reasonable hour. I cooked some rice to go with it, and it was the ultimate crowd-pleaser. 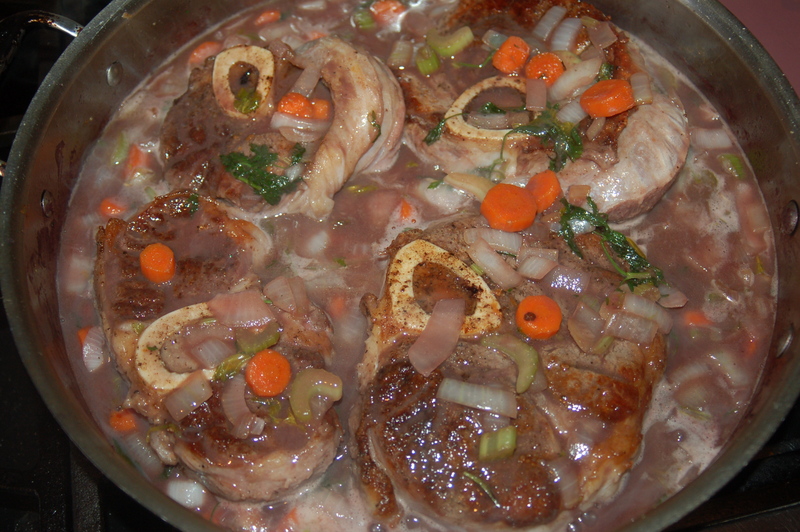 You will need: 4 lb Pork pot roast, thickly sliced (it may say slow-roast on the packaging – also can be a little over, or, a little under 4 lbs), 4 tbs olive oil, 2 carrots, thickly sliced, 6 red storage onions, (you can find these at the farmer’s market in the summertime or use 3 or 4 very small sweet onions, cut in half, if necessary), 3 big garlic cloves, sliced, 3 or 4 long sweet peppers (or 2 regular red peppers, cut into 8 pieces each), 2 sprigs fresh rosemary, 6 sprigs fresh thyme, 1 1/2 tsp smoked paprika (optional), 4 cups chicken or veggie broth, sea salt and freshly ground black pepper for seasoning meat. * If you are planning on cooking rice with this dish, plan on putting it on to cook about 35 minutes before serving, or, cook it earlier and reheat on lowest heat in a covered pot for about 15 minutes. This dish would also be good with boiled potatoes, or pasta of some kind. Check cooking times, and synchronize accordingly. 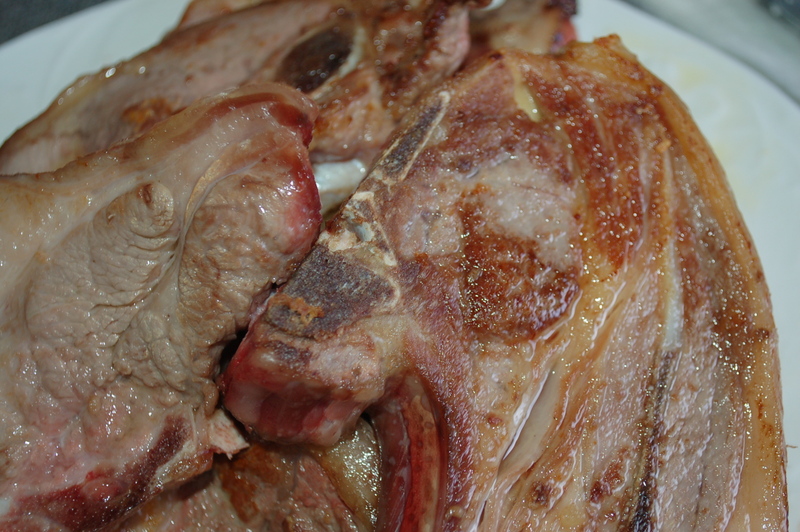 1 – Season your sliced pork with salt and pepper. Put big saute pan on high heat and add 2 tbs oil. When it is very hot, add some of the pork (I had room for 3 slices) and sear on both sides until browned (about 2 to 3 minutes per side). Do not crowd the pan or the meat will not brown! Continue to add oil and sear pork until it is all done, transferring to a plate as you go. 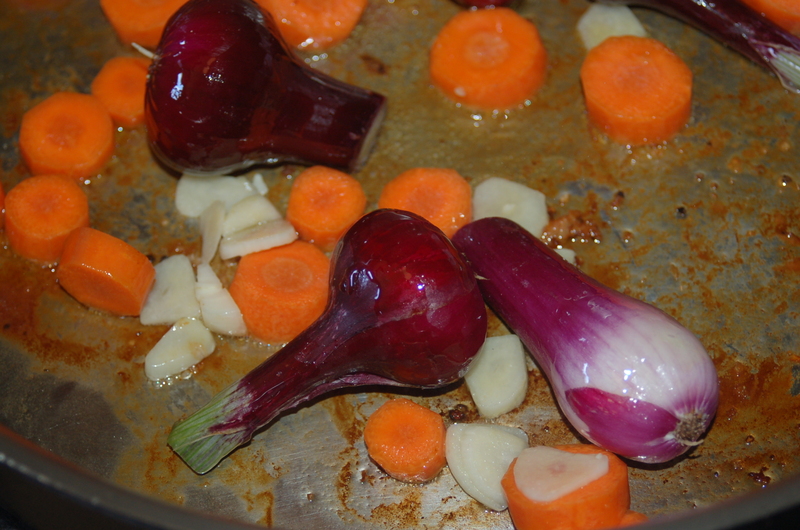 2 – Turn heat down to low/medium and add the onions, garlic and carrots. Cook for about 5 minutes, stirring occasionally. 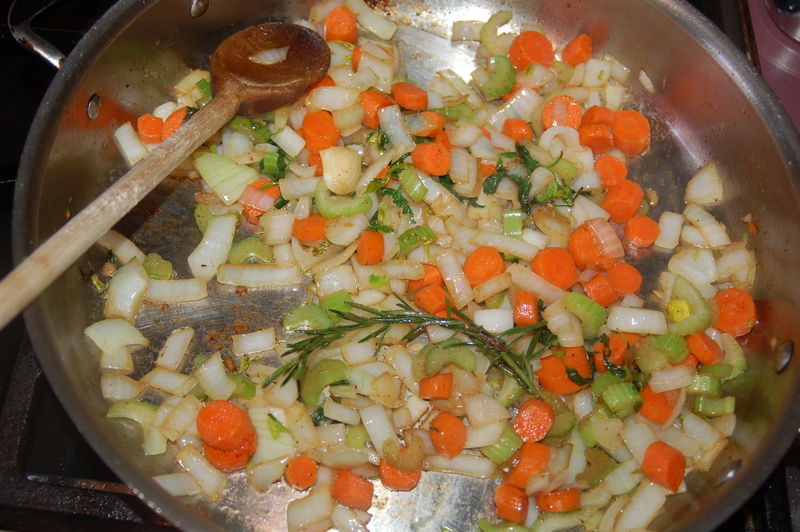 3 – Add the rest of the veggies and herbs and continue to saute for another 3 minutes. 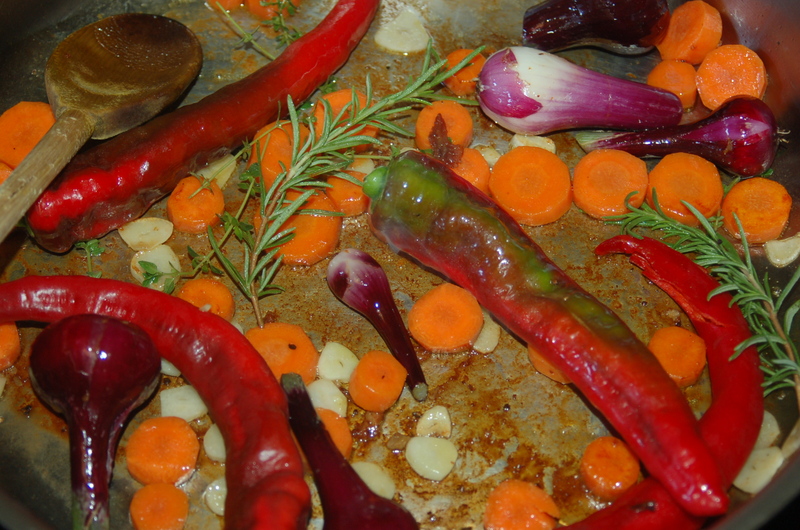 4 – Add the smoked paprika and stir until incorporated. 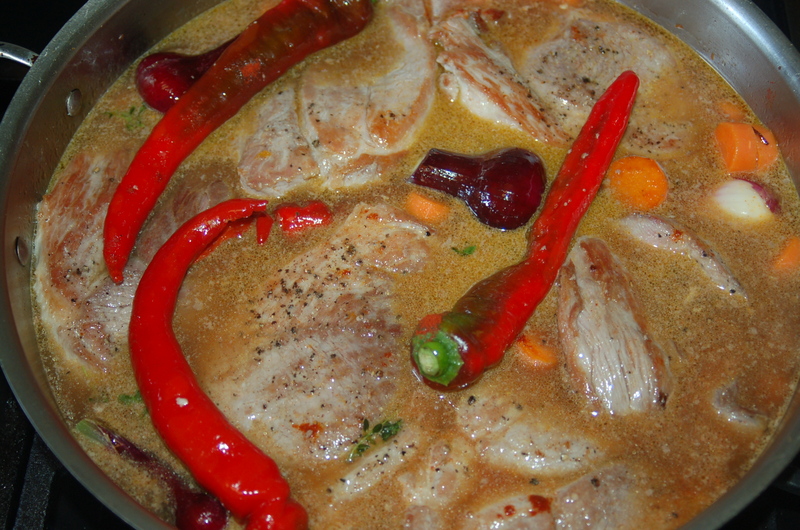 Add the liquids and the pork and turn heat up to high. When everything comes to a boil, turn heat off. Put tinfoil over the top of pan and seal tightly around the edges. Cover with lid and place in the oven for 1 1/2 hours. Do not open oven door during this time as it will tamper with the outcome of your dish. 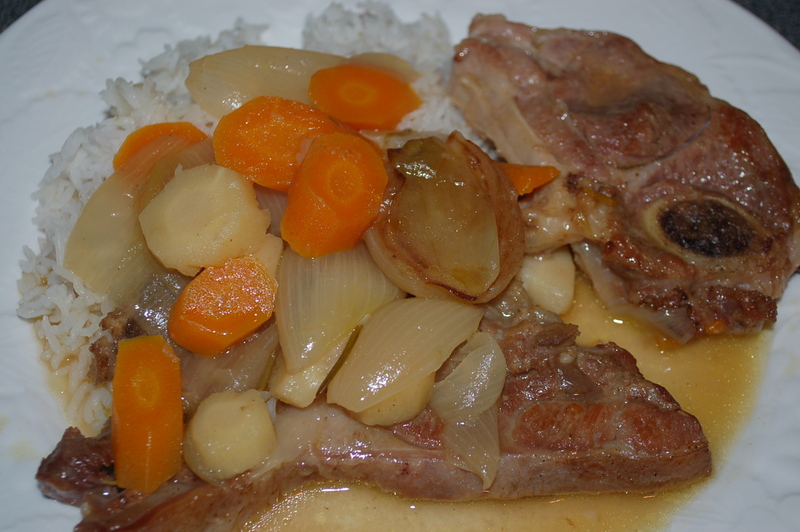 5 – Turn off heat, and leave pork in the oven for another hour (you can leave it up to 3 hours). 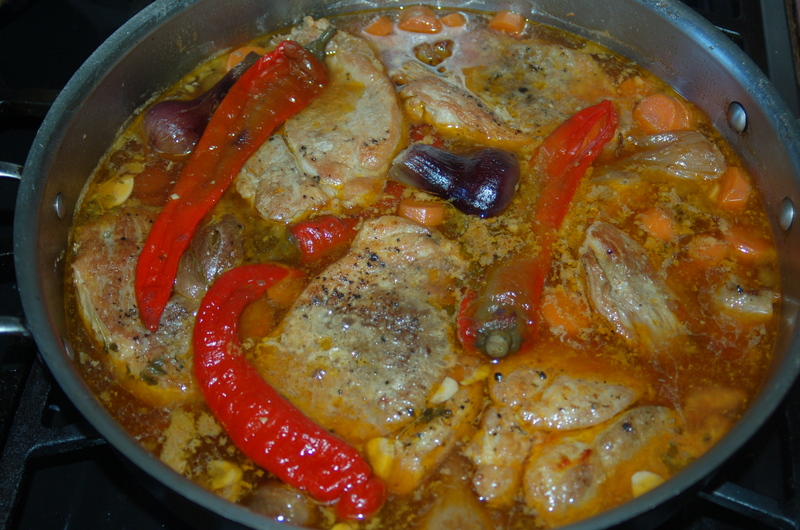 Take out of oven and taste stew for addition of salt and pepper, and adjust according to your liking. 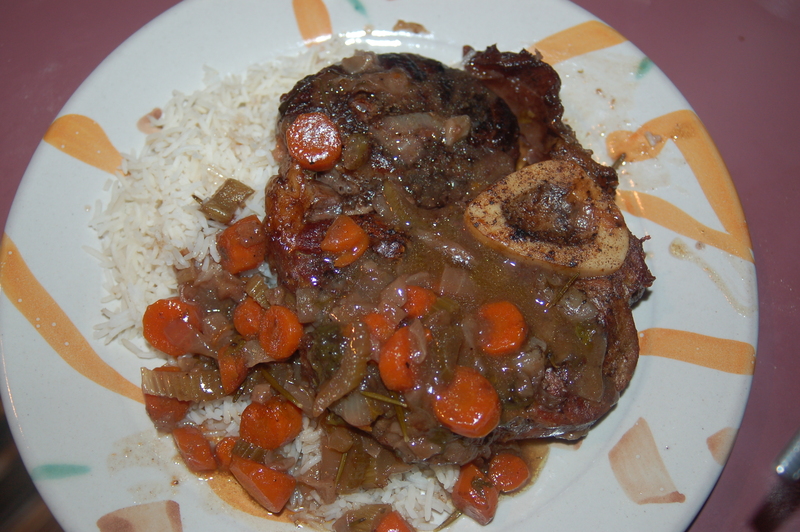 Serve over a bed of rice, giving everyone a nice portion of meat and vegetables. 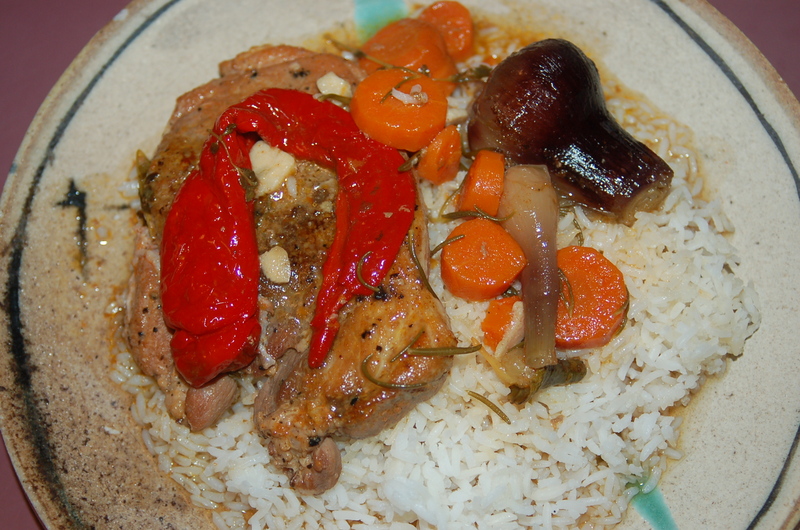 I served the pork stew with rice, and it was yummy. 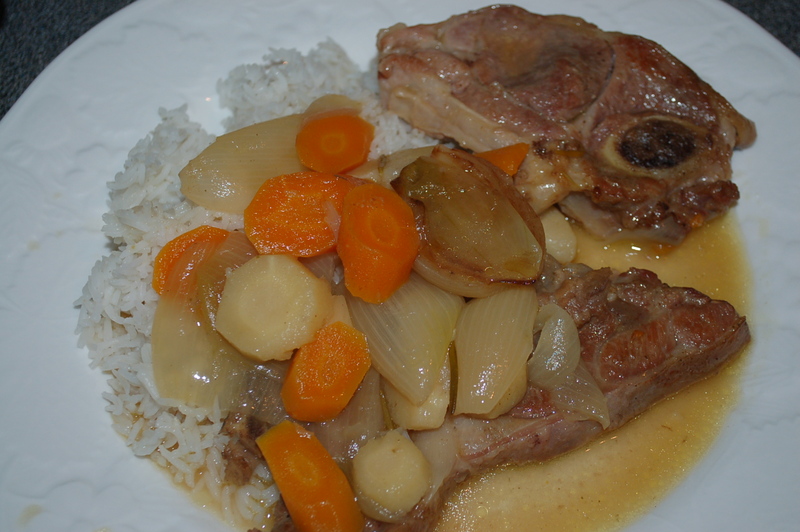 You have to give this recipe a try..
My son asked me to make beef stew and that was the plan. However, when I got to the supermarket I spotted Shin Beef and thought I would still make a stew but add more depth by using red wine and a strong herb. 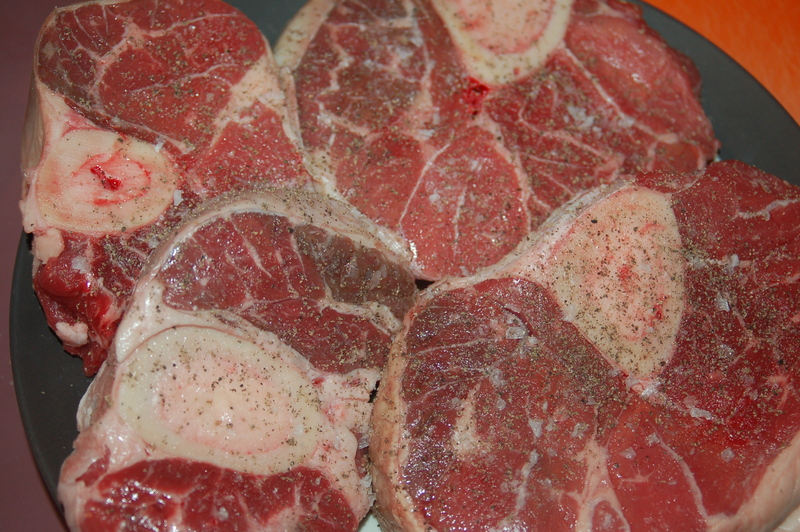 Shin beef is a very rich cut of meat with lots of gelatinous fatty striations. Nothing to be afraid of, but I think people in general are more use to eating nice “clean’ cuts of meat? It needs time to cook so if you are going to try this get it into the oven as soon as possible. The flavors are out of this world and won’t disappoint! 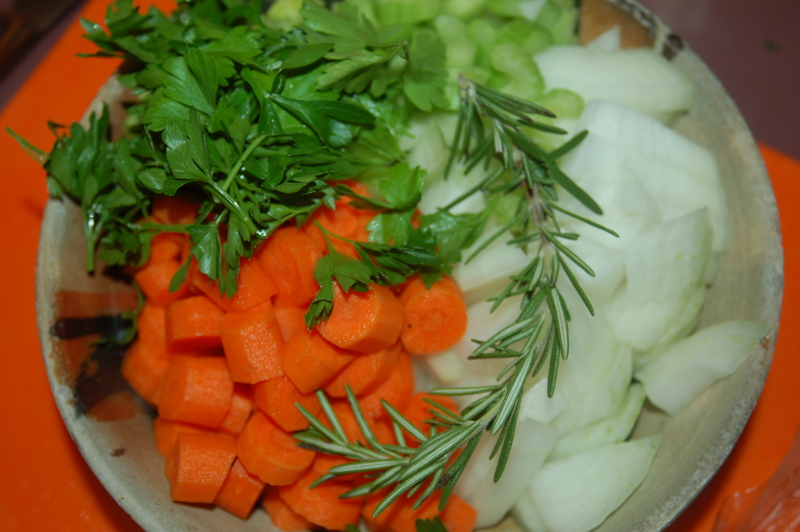 Prep all vegetables before you start cooking..
You will Need: 3 1/2 lbs cross-cut shin beef shanks, 1 sweet onion, diced, 3 carrots, thickly sliced, 2 celery ribs, sliced, 1 sprig fresh rosemary, left whole, 1/2 cup fresh flat-leaf parsley, roughly chopped, 2 tbs flour, 1 cup red wine, 3 cups water, 1 vegetable or chicken bouillon cube, 3 tbs olive oil, coarse salt and freshly ground black pepper for seasoning. This is what Shin Beef looks like (for those of you who don't know) - It has a bone with marrow which turns into a lovely delicacy..
1 – Put beef on a plate and season with salt and pepper. Using a big saute pan or heavy casserole sear the meat in a single lay on high heat in the olive oil (I was able to do this in 1 step but if your pan or casserole has a small surface area it may take 2 batches). sear the beef until brown..
Don’t crowd the pan as meat will not brown. Take meat off and set aside. saute all vegetables for 10 minutes..
2 – Turn heat down to low/medium and add all prepped vegetables to the pan, including the herbs. saute for 10 minutes, stirring often. Add flour and bouillon cube and then the liquids..
3 – Add the flour and bouillon cube (I always chop up the cube before adding to things as it dissolves faster) and give everything a stir for 1 minute. Add the wine and water and bring everything to a boil. 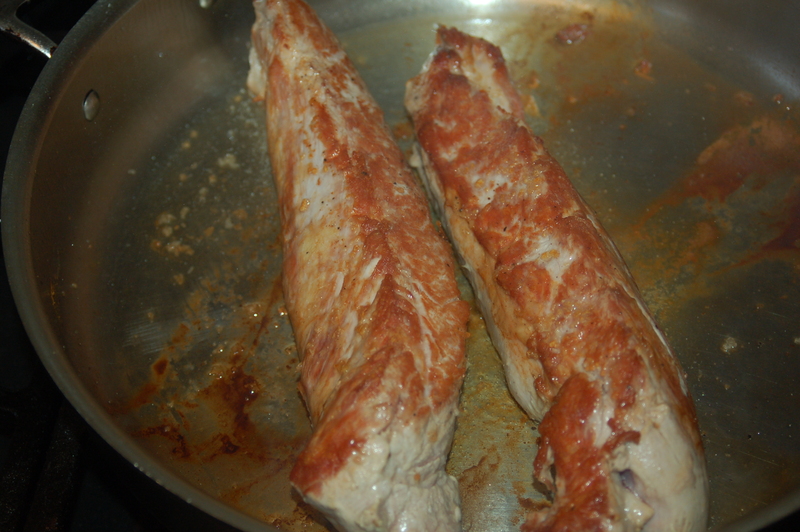 Add the meat and place in oven for 2 hours..
4 – Put meat back into liquid and cover. Place in oven for 2 hours. Test meat by taking a fork and pulling the meat. It should pull away very easily. Let everything sit for about 10 minutes before serving with rice, pasta, boiled potatoes or a salad. Note: The lovely bone marrow can be scooped out and spread on toast points for an appetizer or remove the bone before serving and save it, and the marrow for a snack later, (will post something about that tomorrow).